MWC: LG launches 5in Optimus Vu and quad core Optimus 4X HD smartphones | What Hi-Fi? LG has unveiled a range of new Optimus smartphones of all shapes and sizes at Mobile World Congress in Barcelona. 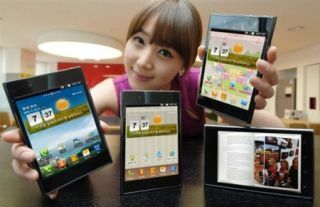 After leaking the LG Optimus 3D Max last week, LG added two more high-spec phones, the quad core Optimus 4X HD and the 5in smartphone-meets-tablet, the Optimus Vu. The LG Optimus 4X HD has a 1.5GHz quad core processor, 4.7in 1280 x 720 HD IPS display and the latest Tegra 3 chip. There's an 8 MP camera, NFC and Bluetooth 4.0 support and 16GB of storage. The Optimus 4X HD can also do 2D-to-3D on-the-fly conversion, which while it can't show on its own screen, can be passed via MHL - micro USB to HDMI - to a 3D screen. It's set to retail at around £500. The big-boy Optimus Vu has a 5in screen, taking on Samsung's Galaxy Note in the big-screen tablet-meets-smartphone category. Despite the 5in, 4:3 ratio, 1024 x 768 resolution HD IPS display, it measures just 8.5mm thin. It also comes with a digital pen, like the Galaxy Note's S-Pen, which can be used to copy and paste content from the screen. Also new is the Optimus L series of affordable smartphones. Three models in all, led by the L7, with a 4.3in screen and Android 4.0 (Ice Cream Sandwich). The L5 has a 4.3in screen, and Android 4.0, while the L3 has a 3.2in screen with Android 2.3 (Gingerbread). We think the L3 could be as little as £150. We'll be posting a blog with hands-on pictures of the Optimus 4X HD, Optimus 3D Max and Optimus L7 shortly.